Taking the kids to the movies can be more than just fun; a few weeks ago I ran into Martino Manetti at the Saturday Afternoon matinee in Greve in Chianti, and he told me he'd be presenting the new releases and a few other things on the following Sunday. So I drove over, arriving (intentionally) late in the afternoon, by which time Martino was frazzled, but the crush of people had died down enough to make a tour of the cellars, with the cement fermentation tanks, botti, and a few barriques quite pleasant, and also to allow one to taste under relaxed conditions. The wines? Martino's father Sergio was never one to follow the dictates of others; he was one of the first to make a Sangiovese in Purezza, leaving the Chianti Classico Consorzio because such a thing was not contemplated at the time by the rules governing Chianti (and for a variety of philosophical differences, mostly regarding quality control and the introduction of new techniques and varietals that he considered an "abomination" in Chianti -- and made sure I wrote it down), and he built his reputation as a winemaker on an unwavering dedication to finesse and elegance. Following his death a few years ago, I wondered what direction Montevertine would take, especially since some of the wine press thought they should "improve" their wines through increased concentration and richness, but Martino has chosen to stay the course Sergio charted, and the wines continue to revolve around finesse and elegance rather than power. This is a Trebbiano, and is pale brassy gold with brassy highlights, and has a moderately rich, fairly alcoholic bouquet with pronounced greenish accents and spice. Bracing and direct. On the palate it's clean, bright, and quite direct, with minerality and some citric fruit that flow into a clean fairly bitter mineral finish. A perfect wine for antipasti, cheesy or creamy first course dishes, and simple white meats. Delightful in its simplicity and the bottle will go very fast. Pale ruby with black reflections and white rim. The bouquet is brisk, with lively cherry fruit supported by raspberry acidity, with dusky bitter accents that add depth. Young and bracing; it brings to mind a teen in first bloom, and the Italian word would be acerbo, which can be a complement when applied to a young lady. On the palate it's bright, and a touch sweeter than I had expected, with bright cherry raspberry fruit supported by clean raspberry acidity and smooth sweet tannins. Quite pleasant as a food wine, and is blessed with lively acidity that will make it perfect with succulent grilled meats; the smoothness of the tannins will allow it to work well with spicier seasonings, while the acidity is such that it will also be nice with fried meats and vegetables. It will go quite quickly in the proper setting, and if you like this style, which is a step into the past, when acidities were bright and smoothness not the goal, you will like it very much. Pale ruby with black reflections. The bouquet is fairly rich, with fairly intense greenish accents and spice mingled with red berry fruit and dappled shade, with berry fruit acidity that provides depth and support. Inviting. On the palate it's clean, bright, and smooth, with powerful berry fruit supported by clean bitter tannins that flow into a clean sour berry fruit finish with bitter accents. A pleasant, very traditional food wine that will go very well with hearty legume-based soups, meat-based pasta sauces, grilled meats, and light stews. By comparison with the 2005 it shows better balance, and this is because of the vintage. Deep cherry ruby with bright cherry rim and black reflections. The bouquet is fairly rich, and young, with violets and floral accents mingling with sour cherry fruit, some acidity, spice, and underlying savory bitterness. Quite a bit going on. On the palate it's full, rich, and smooth, with bright cherry fruit supported by smooth sweet tannins, while direction comes from bright sour cherry acidity, and it all flows into a clean sour cherry fruit finish with some bitter tannic underpinning. Beautiful harmony in a traditional key, and it will drink very well with foods now -- a thick porterhouse cut, or perhaps roast leg of lamb -- though it also has the capacity to age well for at least 5-8 years, and will reward those who wait. Pale garnet, and looks mature than one might have expected if one didn't take the wet, cold, rainy 2002 vintage into account. The bouquet is fairly intense and again mature, with balsamic accents mingling with menthol and berry fruit with underlying underbrush and spice; the overall impression is harmonious and nicely balanced in a cool weather key. On the palate it's full and smooth with bright cherry fruit supported by smooth tannins that are sweet on the outset, but lay a greenish wash over the tongue, and by and moderate acidity, with savory accents that flow into a clean slightly balsamic finish. Pleasant, and will drink well with simple meats, though I wouldn't hold it much longer because it's at its peak. I have often said that interesting wines can emerge from even the most dismal vintages, and here we have an example. A magnum. It's deep almandine ruby with brownish black reflections and almandine rim. The bouquet is rich and mature, with strong savory accents mingled with berry fruit and sea breeze, and supported by warm balsamic acidity. Pleasant and inviting. On the palate it's rich and full, with bright slightly sour berry fruit supported by smooth sweet tannins that have clean balsamic accents and flow into a clean savory finish. Quite elegant, and will add magic to a meal built around a steak or a hearty roast, e.g. leg of lamb. Should you happen upon a well kept bottle, grab it. Going further back, Sergio labeled this wine as a Vino do Tavola and called it a Riserva, paying a fine because the term Riserva was supposed to be used for DOC wines only. But his certainly was a Riserva from a qualitative standpoint. A magnum. Deep almandine with almandine rim. The bouquet is rich and chewy, with sour berry fruit supported by green leather and leaf tobacco with bracing underlying savory accents; it's quick to write about, but shows beautiful harmony and is very enjoyable to sniff. On the palate it's rich and powerful, with beautiful soft berry fruit supported by bright acidity and clean sweet tannins that flow into a clean fresh berry fruit finish. It's surprisingly young for a 95 Sangiovese, and shows great depth and elegance, attracting attention without raising its voice. Beauty in a glass. A magnum. Lively almandine ruby with almandine rim and black-brown reflections. The bouquet is rich, and elegant, with wet leather mingled with some underbrush and berry fruit. Considerable depth, and is doesn't display the heat many central Tuscan 2000 wines do. On the palate it's full and rich, with languid berry fruit -- cherry plum -- supported by smooth sweet tannins that flow into a clean plum finish. Quite elegant, though the advanced ripeness that comes with heat is evident in the plum accents of the fruit and in a relative lack of acidity, which carries into a long finish. Obviously from a less-than-perfect vintage, but the languor of the wine is pleasant, and it does give one a come-hither sort of look. Lively cherry ruby with cherry rim. The bouquet is rich, powerful, and young, with bright cherry fruit supported by clean berry fruit acidity, peppery spice, and some cedar, while there are also youthful floral accents that are in the process of folding into the bouquet. Youth in a glass, but a smiling youth with great potential. On the palate it is again quite young, with bright berry fruit supported by clean sweet tannins that have slight youthful cedary overtones and flow into a clean fresh finish. It's a babe in swaddling clothes, who hasn't yet begun to toddle, but the potential is definitely there. In short, a wine that's well worth seeking out and setting aside for a special occasion in 5-8 year's time; expect it to age well for a decade or more. The score reflects the present, not what it will become. Bottom Line: Beautiful wines that revolve around elegance and finesse, and that invite you to refill your glass. What more could a person ask for? 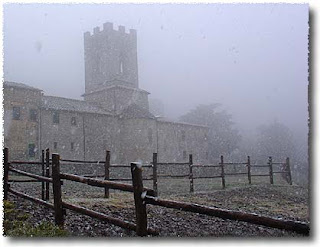 Badia a Coltibuono, which is made from estate grown grapes, following organic agricultural practices. This is what they pour their heart and soul into, and it is, perhaps correctly, what attracts the most attention. Coltibuono, which is made from outsourced grapes, and is considerably higher volume: For the most part what one might call vini da battaglia, in other words inexpensive wines to be set out and drunk. Here we have a couple of the latter, and they drink quite well, as I discovered when I served what remained of the wines I had tasted and taken notes on with the meals that followed -- home cooking for the family, with pasta, burgers and so on. 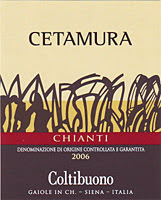 The wines complemented the foods, and this is obviously what I Cancelli and Chianti Cetamura are intended to do. I Cancelli is an IGT wine, a blend of Sangiovese and Syrah, and is aimed at those who might stop by a wine bar for a quick glass with friends in the course of an evening. 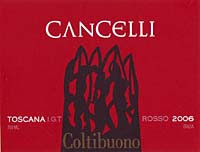 The label, with its bold red interpretation of the gates (I Cancelli) of Badia A Coltibuono's wine cellar reflect this. This is a 70-30 blend of Sangiovese and Syrah, and is deep pigeon blood ruby with black reflections and cherry rim fading to white. The bouquet is fresh and bright, with lively cherry fruit that gains direction from some tart cherry acidity, and depth from spice-laced underbrush, with slight hints of dried mushrooms, and cedar overtones. Nice balance, and harmonious. On the palate it's lighter than I expected from the nose, with moderate fairly tart berry fruit with bitter accents supported by bright brambly tannins that flow into a clean brambly finish with a mineral tannic underpinning and lasting bitterness. It's direct, in an appealingly gangly sort of way, a bright young wine that will work very well with foods, ranging from red-sauced pasta dishes through fried meats, simple grilled meats, and light stews, and given the proper setting -- a quick meal with friends, or perhaps a cookout -- it will go very fast. Deep blackish ruby with hints of violet and white rim. It looks young. The bouquet is fairly rich, with cherry fruit supported by some savory accents and delicate underlying acidity that gains depth from hints of candied lemon peel, which are unusual, but work well. Harmonious. On the palate it's medium bodied, with fairly bright sour cherry fruit that has a slightly languid feel to it, and is supported by a combination of sour cherry acidity and smooth sweet tannins that flow into a warm sour berry fruit finish that gradually fades into bitterness. It's simple and direct, what Italians call a vino a tutto pasto, in other words a wine to set out with the meal and drink: It will do a fine job of supporting foods, ranging from hearty soups and pasta dishes through grilled meats and light stews, without hogging the limelight, and you'll be surprised at how quickly it goes. Bottom line: It would be a nice day-to-day wine. Badia a Coltibuono was one of the first wineries in Chianti Classico to begin bottling on their own. Because of this, their cellars are both fascinating and wonderful, with bottles that go way back. A few years ago I was lucky enough to be invited to a vertical that reached back to the mists of time (or so it seemed), and since you may not have seen it when I first published it, I am republishing it here. Observations are woven into the tasting notes and between the wines. The 46 is the oldest vintage they have, because the Germans who occupied the abbey during the war drank up the cellar. Pale garnet with almandine brick overtones. The bouquet is still very much alive, with an initial rush of leathery balsam that brings an old leather book binding to mind mingled with sea salt and some iodine; swishing brings up dusky cherry fruit and more balsam, while the leather smoothes some, and with time the balsam gains in intensity and hints of spicy tobacco emerge, going hand in had with the balsam. Beautiful, in an elderly key that brings to mind faded lace. On the palate it shoes its age to a greater degree, with rather tart leafy overtones that mingle with sea salt and dust, with considerable very sour cherry tartness that resolves into warm hot steel and saddle leather with tobacco overtones. Interesting; it's not a wine to sip far from the table, and is clearly long on years, but still has a story to tell and will drink well with hearty flavorful stews, for example venison or wild boar. It has held better than many humans of like age. Lots of tannins, in part from the raspi (stems) -- the fermentation was in the individual homesteads, in upright wooden tanks, with whole bunches, stems and all. The 46 was bottled immediately, and had therefore been in bottle for more than 50 years when we tasted it. Impressive. The 46 was entirely from coltura promiscua, the old land management system in which grain was planted between the rows of vines, and there could be other crops as well, or fruit trees. Coltura promiscua required that the vines be worked by hand, and thus could result in excellent quality of the farmers knew what they were doing. Things were changing, however -- they were planning to plant vineyards but hadn't yet. In terms of varietals, these wines are from a white red blend, which they continued to use until 1980. In the early years production was sharecropped, with the share croppers giving a share of the wine to the land owners. 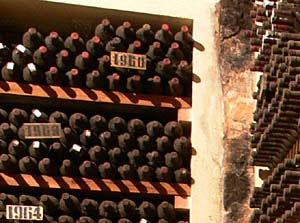 The wines of the 50s through 1980 were kept in ancient (centuries old) chestnut casks, and the older wines still in cask were all bottled in 1981. Since the cellar was cold and damp, the wood kept perfectly, though it was no longer anything but a storage medium. Some of these bottles are still available. Only Chianti Classico Riserva until 1970, because until then the farmers kept the lesser wines themselves, either drinking or selling them. Production of Chianti Classico D'Annata came after 1970. Deep almandine ruby with Moroccan leather and almandine overtones. The bouquet is rather pungent, with spicy saddle leather that mingles with some iodine and sea salt, and underlying wet leaves; a swish brings up a certain amount of acidity and pleasant minty overtones, while leaf tobacco also emerges. Quite a bit going on. On the palate it's surprisingly graceful, with fairly tart cherry fruit supported by lemony acidity and warm smooth tannic overtones that are rather dusty and lead into a clean dusty tannic finish with bitter brambly graphite overtones. One can taste the tannins from the stems, which provide the bitterness, but the overall effect is graceful and there's still quite a bit of life to it. As with the 46 it's a wine that will drink better with foods than on its own, and indeed will be a nice counterpoint to a flavorful stew. In short, if you find a bottle that has been well kept, enjoy it. Almandine ruby with black highlights and almandine rim. The bouquet is rather musty, with wet leaves and well soaked leather at first sniff, and also some balsam. Swishing brings up more of the same, with the leather increasing and taking on penetrating smoky spicy overtones, and also some leaf tobacco that gains support from some acidity. On the palate it is faded, with some sour notes but not much fruit, supported by some tannins that have a dusty feel to them and lead into a bitter finish with iodine overtones. Geriatric, but then again it 41 years old. Almandine with black highlights and almandine leather in the rim. The bouquet is clearly elderly, with pungent smoky spice that mingles with leaf tobacco and some acidity that rises up to tickle the nose. On the palate it's livelier than one might have expected from the nose, with some tart cherry fruit that gives way to balsam and sea salt wit underlying tobacco leaf bitterness, and it all flows into a clean tannic finish with strong bitter India ink overtones -- the stems of the grapes providing their contribution. It's interesting, and though it's not a wine for a casual wine drinker, it does have something to say and will drink well with a hearty stew. Deep orange almandine with black reflections and Moroccan leather rim. The bouquet is clearly well along in years, with spice and leaf tobacco that mingle some slightly greenish overtones. On the palate it's lighter than some of the others, with sea salt and balsam supported by tobaccoey tannins that lead into a clean bitter finish. Though there isn't as much fruit, it has a certain grace, and also a degree of charm; because it is lighter it will work well with grilled meats. The wines of the late 50s and 60s are cut from the same cloth, and this is due to the vineyard replanting of the late 50s. The fashion at the time was to plant what are now known as "fiat vineyards," vineyards with rows far enough apart to allow tractor access. Planting densities are, by modern standards, low, and therefore the yield per plant was fairly high, higher than winemakers would want today. This was one of the best vintages of the 20th century. It's deep black almandine with black highlights and almandine rim; by comparison with the older wines it's livelier. The bouquet is clean, and delicate, with some lacy berry fruit that mingles with slight balsam and hints of spice and salty leaf tobacco that become stronger with more swishing. Deft, and a fair amount going on; it gives an impression of distance. On the palate it's full and quite rich, surprisingly so considering its age, with delicate slightly sour cherry fruit supported by clean dusty tannins that have warm bitter overtones and lead into a warm clean finish. Elegant, and though it's obviously not a young wine it still has quite a bit to say, and will work well with a steak or light stew. If you find a bottle, do enjoy it. A dreadful vintage, and since Dr. Stucchi's policy was to bottle the best cask of the vintage as Riserva regardless, theirs was the only Chianti Classico Riserva 1976 made. The Consorzio had to special order the Galli (black roosters) to put on the bottle necks. The wine is almandine with pale black highlights and Moroccan leather rim paling to white. The bouquet is tired, and this cones as no surprise considering the vintage, with musty slightly smoky penetrating leaf tobacco mingled with damp underbrush and underlying saltiness. On the palate it's thin, with hints of cherry fruit supported by bitter rather evanescent tannins that flow into a clean bitter finish with slight sour cherry fruit overtones and alcoholic notes that rise up into the back of the throat. It has, to put it simply, faded, and given the 76 vintage this comes as no surprise, though the way it has faded shows that there was something there to begin with. Almandine with pale ruby notes and black highlights, Moroccan leather rim. The bouquet is unusual, with a rush of menthol at first sniff that brings Vicks Vaporub to mind underlain by balsam and sea salt; swishing brings forth more mint and some leaf tobacco, but the mint remains paramount. On the palate it's full, and surprisingly smooth, with delicate cherry fruit that has slight tart raspberry overtones and is supported by smooth sweet tannins that have slight minty overtones and lead into a clean warm cherry laced finish with (again) balsam and mint. All this talk of mint may seem off-putting, but the wine manages considerable grace, albeit in an elderly, lacy key, and will drink nicely with succulent white meats. Deep black almandine ruby with black highlights and Moroccan leather rim. The bouquet is a bit off, with old wet leather that has been soaking for a long time mingled with sea salt and some cedar, hints of acidity, and slightly sour leaf tobacco. No fruit to speak of, and not much depth. On the palate it's mouth-filling, though oddly flat; there's a presence that expands off the tongue to press against the cheeks, but there isn't much in the way of fruit to it, and it's all supported by clean balsam laced bitter tannins that lead into a warm, balsamic finish. It feels like the soul is missing, in a way. Maurizio Castelli, who has been their enologist for many, many years, says the grapes didn't ripen. Sangiovese in purezza from here on. Deep black almandine ruby with black highlights, some ruby highlights, and almandine rim with Moroccan leather overtones. The bouquet is unexpected, with hot steel and hints of balsam that mingle with wood smoke; with time some cherry fruit emerges too. On the palate it feels stripped bare, much like the 1980, though in this case there's a little more cherry fruit, supported by tannins that have faded into thinness, though they feel as if they once had a burr, and flow into a balsamic finish with cherry overtones. It's gives an impression of thinness, though this is an effect of age -- it obviously had considerable grace to start out with, and has evolved into laciness with time. Graceful, but requires thought. This is another historic vintage, with a long sunny fall. Deep black almandine ruby with almandine ruby that has some orange overtones in the rim. The bouquet is clean, with cut leaf tobacco and bitter underbrush; not much fruit on the nose, though there is some underlying cherry that provides depth and direction. Also considerable graphite shavings. With time the fruit opens and becomes stronger. On the palate it's full and quite smooth, with powerful dusty cherry fruit supported by smooth sweet tannins that flow into a clean sweet cherry laced finish with lots of dust and some bitter cedary notes. Pleasing, and fully mature; because of the bitter dustiness it won't do well as a sipping wine, but it will instead work quite well with hearty stews or succulent grilled meats, especially steaks. Quite nice and worth seeking out. 1985 and 1988 were both great vintages, and the 86, which is sandwiched between them, has always gotten short shrift that is perhaps undeserved. Black almandine with almandine rim. The bouquet is delicate, with leaf tobacco and balsamic notes supported by underlying bitterness and sea salt, with hints of sour cherry fruit that provide direction. Also peppery spice, slight mint and pencil shavings. On the palate it's full, and quite smooth, with delicate slightly tart cherry and forest berry fruit supported by velvety tannins that still display a slight burr, and flow into a clean cherry laced dusty finish. It is better that its reputation, though it doesn't have the power of the 85-88 set, and will work nicely with red meats or stews. Has lived its life and is coming down. This was perhaps even better than 1985, in part because of what the winemakers learned about handling a long sunny fall from the 1985 vintage. Deep black almandine ruby with black reflections and almandine rim; gives an impression of vibrancy. The bouquet at first sniff is more delicate than one might have expected, with slightly sour cherry fruit supported by balsam and hints of bitter sea salt with underlying leaf tobacco; more swishing brings forth stronger tobaccoey spice that takes on a reddish cast from the underlying berry fruit, and gains life from some acidity. On the palate it's full and warm, with pleasing sour cherry fruit supported by smooth warm tannins that lead into a warm clean tannic finish with sour cherry overtones; though it doesn't flow over the tongue exuberantly, and indeed shows a degree of restraint, it is graceful, and will work quite nicely with foods, for example a platter of mixed grilled meats. You may wish you had a second bottle. Deep black almandine ruby with hints of Moroccan leather in the rim. By comparison with the 88 it's slightly more shifted towards brick. The bouquet is clean, with delicate spice and sour cherry that mingle with some mint, warmth, and slight brandied cherries; it's quite nice and there's a lot to plumb. On the palate it's full, though not huge, and to be frank is more about finesse than opulence, with delicate balsam-laced slightly bitter cherry fruit that has leaf tobacco overtones and is supported by clean dusty tannins that lead into a long warm balsamic finish with considerable warmth and some fruit that gain definition from bitter pencil shavings. By comparison with the 88 it displays more finesse, though a little less power. The 1993 vintage looked quite promising until September 23, when it began to rain, and didn't stop for a month. This made the harvest quite difficult, though not as difficult as the 92 (when it rained more). Deep cherry ruby with almandine in the rim. The bouquet is unusual, with peat smoke and cherry fruit that mingle with peppery spice; with more swishing the fruit comes to the fore. On the palate it's medium bodied, with a thin feeling to it that is the vintage at work, and pleasing cherry fruit that is supported by smooth sweet tannins. To be frank it's not a great wine -- a month of rains beginning just before the harvest preclude greatness -- but it does display considerable grace and will drink quite well with succulent red meats. In short, how to draw a success from an adverse situation; an Italian might say, tanto di cappello, and tip his hat. 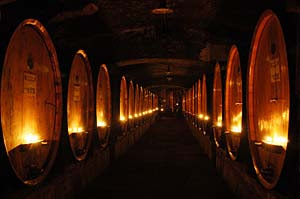 Even with the recent increase in area, from 95 to about 150 hectares, Carmignano remains Italy's smallest appellation. It's also one of the oldest: In 1716 Cosimo III De'Medici set forth its boundaries in an edict that also defined the Chianti Classico, Pomino (now Chianti Rufina), and Upper Valdarno areas -- the first true appellations in the modern sense of the term. Of course he was simply recognizing a state of affairs; the Carmignano area, which encompasses the eastward-facing slopes of Monte Albano, overlooking the city of Prato, was known for wine long before then: In the 1300s Ser Lapo Mazzei, a Notary whose descendants own Castello di Fonterutoli, one of the oldest Chianti Classico estates, wrote Francesco Datini, one of the great merchants of the time, to tell him he had secured 15 some (a measure that varied from town to town, but was what an animal could carry) of "Charmignano" wine. The area was subsequently selected to receive the Cabernet cuttings that were imported when Caerina de'Medici was Queen of France, and Cosimo III himself grew Cabernet, which was locally known as uva Francesca. Despite the popularity of Carmignano's wines, which persisted throughout the 1800s -- both the Niccolini and Artimino estates exported Carmignano to other European countries -- the appellation was legislated out of existence in the 1930s, when those governing wine production decreed that the wines of Carmignano be labeled Chianti Montalbano, one of the lesser appellations that arose when bottlers thoughout Tuscany began to slap the word Chianti on their labels. And so things remained until the early 1970s, when Count Ugo Bonaccossi took the reins of Villa Capezzana, Carmignano's largest and oldest estate (it's mentioned in an 8th century deed, "with olive trees and vineyards," now in Florence's archives; the Bonaccossi family bought it in the 20s from the Rothchilds, when they also bought out Niccolini). Count Ugo mounted a campaign to reinstate the Carmignano Appellation, enlisting the assistance of local politicians and the late Luigin Veronelli, one of Italy's most influential wine journalists, and in 1975 succeeded. Since an area cannot have two Appellations made from the same grapes, the legislators included a small percentage of Cabernet in Carmignano to distinguish it from Chianti Montalbano, and in doing so recognized Carmignano's traditional use of French varietals. Unfortunately, after its birth the Carmignano Appellation languished; it was simply too small -- 95 hectares and 8 producers, with Capezzana by far the largest -- to draw journalists away from Sassicaia and the Supertuscans emerging from cellars in Chianti Classico. Nor did the increase in status from DOC to DOCG that came in 1988 have much effect. Since then, however, a number of things have happened. Most importantly, the owners of the appellation's other estates, many of whom are industrialists in the city of Prato, have taken a much more active interest in their wineries, and as a result the overall quality level has risen substantially; in addition, membership in the Congregazione, as the Consorzio is called, has increased to 15, while the total vineyard area has increased to 150 hectares, about 330 acres (by way of comparison, this is less than a 10th of the Brunello vineyard area, which is also considered fairly small), with another 30% increase expected by 2010. The new vineyards are planted to high densities, with some winemakers returning to the 1.8 meters between rows of the pre-tractor tenant farmer days, and some going even further, up to 10,000 vines per hectare. The second major development is that the City of Prato, which had long chafed at being a "suburb" of Florence, became independent in 1992.Since then they have done a great deal to promote local products, including, of course, wine. As a result of both increased quality and increased exposure, Carmignano has begun to carve out a space in both the national and international markets. The vineyards are located in the Communes of Carmignano and Poggio a Caiano, on hillsides whose elevations range between 50 and 200 meters above sea level; this is lower than Chianti Classico, where the elevations range from 200 to 600 meters above sea level, and as a result daytime temperatures are warmer during the summer months, and this hastens the ripening and therefore the harvest, which is usually a couple of weeks ahead of Chianti Classico's. Carmignano is also just a few miles from the higher peaks of the Apennines, and because of this proximity it gets the night breezes, which bring temperatures down sharply, thus guaranteeing good temperature excursions that help the bouquet to develop. These mountains also bring the occasional summer thunderstorm, the rainfall from which, according to Count Ugo, helps maintain balance in the vineyards and further promotes ripening. Winding down, a couple of words on the vintages presented. Some of the whites, the Vin Ruspo, and about half of the Barco Reale are from the 2006 vintage. This is a very good vintage; the spring was mild, without frosts, and this helped the vines start the vegetative cycle; things were going well until the end of May, when a sudden temperature drop impacted the flowering phase; not as many grapes formed as usual, making for bunches that were spargoli, in other words open (as opposed to tightly packed and compact), with good ventilation around the grapes. A good thing, and the grapes developed well during the hot days of July, while rains in August prevented draught stress, and primed them for the final push into ripeness in September, which was aided by perfect weather. In short, the 2006 vintage was very good, with beautiful balance between power and finesse, and is yielding wines of considerable character and dexterity. What I have seen of the Barco Reale leads me to expect very nice things from the 2006 Carmignano that will be released next year. Some of the Barco Reale and much of the Carmignano poured this time was from the 2005 vintage. By comparison with the 2006 vintage it is considerably poorer; the spring of 2005 was wet and cool, and this wetness continued on into the summer, which saw rains every few days. Fine weather for lawns, but less so for vineyards, and in tasting the wines I had a general impression that the grapes ripened with difficulty; the aromas are much earthier, and there's considerably less fruit than one finds in more blessed vintages. This said, I did find some wines that I greatly enjoyed, because a difficult vintage presents a challenge and good winemakers do very well when faced with challenges. In short, there are good 2005 Carmignano wines, but greater care is required in selecting them. Some of the Carmignano Base and almost all of the Riserva poured were from the 2004 vintage, and as such they represented a refreshing step up from the 2005: It was a good vintage that yielded elegant wines that strike a pleasant balance between power and finesse, and show great potential for the future. Carmignano base 2004 is entering maturity and quite pleasant to drink now, though it will improve further for a couple of years, and hold well for at least 5. The 2004 Riserva is instead young, and though one could drink it now, it will profit from another year or two in bottle, and if you have the patience to allow it to mature for longer, up to 5 years, you will be richly rewarded. Expect it to continue to age well at least through 1015. Expect the Carmignano producers' IGT wines to follow the same path. In short, Carmignano's 2004 vintage is well worth seeking out. Brassy gold with greenish highlights and brassy reflections. The bouquet is moderately rich, with mineral acidity and some warmth. On the palate it's ample, with broad heather-laced lemony acidity that stretches across the palate, and flows into a clean slightly greenish citric finish. It's a bit unusual, somehow bringing to mind a person with gushing enthusiasm, and though it's not long on finesse has a pleasing overcharged eagerness to it; it will drink well with hearty soups, vegetable based pasta sauces or creamy risotti, and with creamy white meats. Lively blackish rose pink with white rim. The bouquet is bright, and fairly green, with raspberry fruit mingled with some artichoke and underlying alcohol, also savory sea salt. Inviting in a franly wide-eyed smiling key. On the palate it's fairly bright, with bright sour raspberry fruit that gains depth from greenish accents and a slight vegetal burr that flow into a clean bitter finish. It's pleasant in a direct, up front sort of way, and will drink quite well with simple grilled meats that aren't too fatty, or with lighter pasta dishes and salad fixings. In other words, it's a nice cookout wine, that will work well indoors too, and there is sufficient acidity for it to stand up to fried foods as well. The Italian word might be polivalente, suited to many uses. Worth seeking out. Deep cherry ruby with black reflections and cherry rim. The bouquet is lively, with bright sour berry fruit supported by strong greenish accents and some brambly overtones. Feisty. On the palate it's again bright, with lively cherry fruit supported by slightly greenish acidity and by smooth sweet tannins that have a greenish vegetal burr, and flow into a clean bitter finish with vegetal accents. Pleasant, and will drink well with simple meats or light stews; expect it to go quickly. Worth seeking out. Deep black cherry ruby with black reflections and cherry rim. The bouquet is decidedly greenish and fairly rich, with vegetal accents, a mixture of artichoke and asparagus stalk, mingled with red berry fruit and some chalky underbrush. On the palate it's medium bodied, with fairly bright berry fruit supported by moderate warm acidity, and to a greater degree by tannins that have a warm vegetal burr and flow into a clean fairly bitter vegetal finish with savory accents. It's up front, and will drink well with grilled meats or light stews, and also has the wherewithal to work well with succulent, not too fatty roasts. Leg of lamb cooked medium (which is how Italians prefer it), for example. Deep black cherry ruby with black reflections and cherry rim. The bouquet is moderately intense, and fairly green, with grilled bell pepper mingled with spice and some hints of cedar, with underbrush as well. Not much fruit. On the palate it's medium bodied, with moderately intense bitter berry fruit supported by moderate acidity, and by clean brambly tannins that flow into a clean bitter tannic finish with some mineral acidity as well. It's fairly direct, and what one has is the interplay between tannins and savory accents more than fruit. In other words, I found it interesting, but if you're looking for a fruit driven wine this isn't it. If you're not, with will work well with simple grilled meats or light stews. Deep black cherry ruby with black reflections and cherry rim. The bouquet is fairly rich, with greenish vegetal accents mingled with red berry fruit and some cedar; it's pleasant enough, though I'd have liked a little more richness to the fruit. On the palate it's medium bodied, and bitter, with tannins and savory accents stepping in to fill in for the fruit, which has gone AWOL. Disconcerting, to be honest. I would have expected more from a Carmignano Riserva, and especially a 2004 Riserva given the 2004 Carmignano Base. Deep pigeon blood ruby with black cherry rim. The bouquet is fairly intense, and rather mature, with balsamic notes mingling with animal tang and warmth, and underlying savory accents; there's also some green leather and leaf tobacco in the mix. On the palate it's fairly full, and more mineral than fruity, with considerable bitter graphite minerality supported by some mineral acidity and smooth rather bitter tannins that flow into a long savory bitter finish. It has personality, and a fair depth, and though it isn't a wine I would suggest to lovers of smooth soft fruity wines, it is pleasant if you like this much more austere style -- this is not a wine that greets one with open arms, but rather demands some attention and thought -- it will drink well with succulent roasts or stews. In short, a particular wine that you will like or not. I enjoyed it. Worth seeking out. Pale amber with lively amber reflections and apricot orange highlights. The bouquet is fairly rich, with walnut skins and bitterness mingled with brown sugar and some oatmeal. Fairly direct, overall. On the palate it's again direct, and fairly sweet, with not much in the way of depth -- the sweetness is tempered by dried apricot acidity that serves to provide direction, but it carries through into the finish without much else in terms of additions, and as a result the overall impression is rather direct. Brassy greenish gold with brassy reflections. The bouquet is muted, with moderate acidity and some dusky savory greenish accents that gradually reveal some pineapple fruit as well. On the palate it's soft, with dusky pineapple fruit that gains depth from moderate acidity and some cedar-laced fullness that flows into a clean savory finish. It's fairly direct, and will work well with aperitifs, or with soups or creamy white meats. Pale salmon with orange in the rim. The bouquet is moderately intense, with slight raspberry and to a much greater degree vegetal accents, mingled with eucalyptus and peppery spice. On the palate it's light, with moderately intense sour berry fruit supported by moderate decidedly brambly acidity and some bitterness that flow into a fairly bitter finish. It's simple, and direct, and will drink well with hearty legume-based soups, pasta dishes, and quickly grilled meats. Deep cherry ruby with black reflections and cherry rim. The bouquet is fairly bright, with berry fruit mingled with graphite shavings and some cedar, with underlying sweetness that adds a tantalizing something. On the palate it's medium bodied, with fairly bright berry fruit that is directed more by tannic structure than acidity, and in other words follows a bitter trail that flows into a clean bitter finish. It's pleasant, though I would have liked a little more acidity; it will drink well with simple pasta dishes served with meat or red sauces, and lighter grilled meats and stews. Deep pigeon blood ruby with cherry ruby rim; it's close to being poured ink. The bouquet is concentrated, with a rush of grilled bell pepper mingled with bitter graphite shavings and underbrush. It smells very much like Cabernet, and in doing so shows how much the varietal can affect a blend. On the palate it's full, with rich black currant and cherry fruit that gains direction from bitter pencil shaving accents and slight acidity, while the support derives from tannins that have decidedly greenish bitter accents, and flow into a clean vegetal finish. It's on the Cabernet extreme of Carmignano, and you should only consider it if you like the varietal. If you do, it is fairly graceful -- there's no attempt at tremendous concentration -- will drink well with light stews, grilled meats, or simple roasts. Expect it to hold well for 3-5 years. Deep pigeon blood ruby with black reflections. The bouquet is not shot tight, but not expansive either; there's balsamic warmth and alcohol mingled with cedar, and slightly greenish accents, but not much fruit. On the palate it's full, with moderate berry fruit supported by clean bitter tannins that have a considerable cedar overlay, and flow into a clean cedar-laced finish. I'd have liked greater depth to the fruit, which isn't as present as I might have liked, and this is likely attributable to the vintage. Deep pigeon blood ruby with cherry rim. The bouquet is fairly rich, with cherry fruit supported by sea salt savory accents and cedar, with pleasant spice as well. Nice balance in a fairly youthful way, and t gives the impression that it will become lacy and ethereal with time. On the palate it's full, with fairly rich cherry berry fruit that has glancing graphite bitterness to provide direction and depth while the tannins are smooth and bitter -- quinine almost comes to mind -- and flow into a clean bitter savory finish. It's nicely balanced in an austere key, and if you like wines that are immediate and fruit driven it won't work for you. If you instead like wines with greater austerity and distance, it does have quite a bit to say to those who will give it the attention it demands. In other words, not for everyone, but if you like the style you will enjoy it. Drink it with succulent roasts or hearty stews, including game, and expect it to age for a decade or more. Deep cherry ruby with black reflections and cherry rim. The bouquet is fairly intense, with bitter accents that bring to mind dappled shade, mingled with some berry fruit and vegetal overtones. On the palate it's medium bodied, and smooth, with moderately intense cherry fruit that is supported by smooth slightly bitter tannins that have a lax feel to them, while there isn't much acidity to provide direction -- the tannins carry the show, and it would have helped had they had more bitter accents to carry it. In short, a simple, direct wine that will work well with simple foods, but doesn't give one much to ponder. Deep pigeon blood ruby with black reflections and cherry rim. The bouquet is fairly rich, with cherry fruit laced with black currants, and some underlying berry fruit jam, which gains depth and direction from some leafy underbrush. Nice balance. On the palate it's medium bodied, with fairly rich cherry black currant fruit that gains direction from moderately intense cherry acidity, and is supported by clean sweet tannins that have a slightly bitter brambly burr to them, and flow into a clean savory finish with brambly accents. It's pleasant, in a fairly lean key, and will drink nicely with simple grilled meats or light stews. Deep black cherry ruby with black reflections and cherry rim. The bouquet is fairly rich, and quite ripe, with jammy forest berry fruit supported by sweet accents and vanilla-laced spice with some violets mixed in; the overall impression is opulent, like a starlet in a glass. On the palate it's fairly full, with intense cherry plum fruit supported by ample sweet tannins and moderate acidity that flows into a clean bitter finish. It's a bit lax, with the opulence of the nose spreading more than I might have liked, and though it's not flabby it is headed in that direction. Because of its softness it will work best with drier meats or roasts. Deep pigeon blood ruby with black reflections and cherry rim. The bouquet is moderately intense, with savory accents and wood glue mingled with some spice; with more swishing vegetal accents also emerge, supplanting the wood glue. Not much fruit, however. On the palate it's medium bodied, with moderate fruit supported by bitter vegetal acidity and some savory accents, while the tannic support is fairly clean, and it flows into a clean bitter finish. I'd have liked greater depth and tightness than I found; it's a bit lax. This said, it will drink well with drier meats. Deep pigeon blood ruby with black reflections and cherry rim. The bouquet is moderately intense, with savory accents and some raw beef mingled with balsamic notes and some underbrush; there's also a fair amount of alcohol. On the palate it's medium bodied, with moderate fairly dry berry fruit supported by savory tannins that flow into a distinctly savory finish with bitter underpinning. It's lacking in fruit, and also ha s a tired feel to it, both problems that are, I think, related to the vintage. This said, in terms of accompaniments it will work well with grilled meats or stews. Impenetrable pigeon blood ruby with deep ruby reflections and black rim. The bouquet is fairly rich, with cedar and underbrush mingled with savory accents and alcoholic warmth, with hints of raw beef as well. On the palate it's medium bodied, with fairly intense greenish black currant fruit -- the vegetal notes from Cabernet are quite obvious -- supported by mineral acidity and greenish vegetal tannins that flow into a bitter, savory finish with lasting warmth. In a word, it's standoffish; if you like this rather reserved style, it will drink well with roasted or grilled meats, and will also be nice with stews. But you have to like the style, which isn't fruit driven. I would also be tempted to set it aside for a few years, because it might do interesting things in a lacy, ethereal key with time. Deep pigeon blood ruby with cherry ruby rim. The nose is reduced at the outset, smelling of rotten egg -- this can happen with newly bottled wines, and often fades with time, indeed, as it oxygenates it opens to reveal bitter vegetal accents and brambly notes, with some sea salt and underlying red berry fruit. On the palate it's bright, with clean fairly rich red berry fruit supported by bitter accents, moderate acidity, and smooth slightly greenish tannins that flow into a clean bitter finish. Once it gets the air it needs it's pleasant; I found myself thinking of creamy meat-based risotti as I sipped it, and it will also drink well with simple grilled meats or light stews. Worth seeking out. Deep pigeon blood ruby with cherry rim. The bouquet is greenish, with moderate spice and some, but not too much, berry fruit. Also slight metallic accents. On the palate it's medium bodied, with fairly rich red berry fruit supported by clean slightly greenish tannins and moderate acidity that flow into a clean bitter finish with savory accents. It's a child of the vintage, and not as rich in terms of fruit as I'd have liked; there's also a degree of thinness to I that is again related to the vintage. This said, it will drink nicely with simple grilled meats or light stews. Amber with apricot reflections. The bouquet is lively, with oatmeal and brown sugar mingled with warmth and dried apricot, which also contributes warm dried apricot acidity, while sweetness serves to hold it all together. Pleasant to sniff. On the palate it's medium bodied and sweet, with deft dried apricot acidity that keeps it from being cloying, while the aldehydes in the wine bring walnut skin flavors and a buttery feel to the lips, and it flows into a long sweet oatmeal finish with underlying walnut skin bitterness and warmth. Pleasant, and has quite a bit to say; it's one of those wines one can curl up in front of a fire with, and have a nice conversation. Worth seeking out. Lively brassy gold with brassy reflections and golden highlights. Charged. The bouquet is fairly rich, and delicate, with butterscotch mingled with tropical fruit and some underlying spice; there's also some sweetness to it, and hits of crushed almonds that bring marzipan to mind. Graceful, and inviting. On the palate it's ample and smooth, with bright minerality supported by some bitter almonds, and savory accents that flow into a clean savory mineral finish. Graceful, and will drink quite nicely as an aperitif or with delicately flavored fish or white meats. Carmignano's whites do have potential, but most try too hard and come up short. This one doesn't, and profits thereby. Worth seeking out. Deep pigeon blood ruby with black reflections and black cherry rim. The bouquet is eye-opening, with violets mingled with airy spice and chemical aromas that become more vegetal with swishing, coming to resemble artichokes. On the palate it's medium bodied, with moderately intense red berry fruit supported by acidity and by greenish tannins that have a burr to them, and flow into a dusty bitter finish. It's direct, and will drink well with simple red sauced pasta dishes or light stews. Impenetrable pyrope with black cherry rim. Poured ink. The bouquet is bright, and fresh, with violets mingled with jammy berry fruit and sweet accents. Voluptuous. On the palate it's medium bodied at the outset, with initially fairly full cherry plum fruit that gains direction from moderate bitter mineral acidity; alas, it abruptly deflates, rather like a balloon when the air is let out, giving way to tannins that have a splintery burr and flow into a clean bitter graphite finish. A pity, because the outset was promising in an international key. Deep pigeon blood ruby with black reflections and cherry rim. The bouquet is fairly rich, with cherry and forest berry fruit mingled with some greenish accents, hardwood ash, and underlying cedar. On the palate it's full, with bright cherry and black currant fruit supported by clean berry fruit acidity, and by tannins that have a clean slightly vegetal burr and flow into a clean tannic finish. It's pleasant, in a very young sort of way, and will drink well with succulent red meats off the grill -- both the porterhouse cut and lamb chops come to mind -- or with stews, and one could also press it into service with a roast. In short, versatile, and you can expect the bottle to go quickly. Worth seeking out. Impenetrable pyrope ruby with violet rim; poured ink. The bouquet is fairly rich, with berry fruit supported by some bell pepper accents and savory overtones; there's also some balsam and warmth, and a fellow taster mutters about raw beef, while I find more iodine than meat. On the palate it's ample, with rich cherry plum fruit supported by clean bitter accents and savory overtones, while the direction is from savory minerality, and the structure derives from clean sweet tannins that are graceful in a light, willowy sort of way. There's more finesse than power, and it gives an impression of being in a holding pattern, as it were -- it's getting its bearings, and its act together, at present. It will clean up nicely over the next 2-3 years, and hold well for a decade more. In short, great potential, and worth seeking out to set aside. Tawny amber with deep dried apricot gold reflections and amber rim with brownish highlights. The bouquet is fairly rich, with candied fruit -- a mixture of melon rind and orange peel -- supported by sweetness and warmth, with alcohol and acidity to keep it on its toes. Inviting, though the candied fruit isn't absolutely typical of a vinsanto. On the palate it's rich, and sweet, with ample dried apricot fruit supported by dried apricot warmth that has hints of honeydew melon that grow stronger as it flows into a long clean fairly sweet finish that is kept from being cloying by the acidity of the dried fruit, while some brown sugar emerges with time. Considerable depth, and though it's not quite typical of a vinsanto it is quite pleasant, and will contribute considerably to a conversation held around the fire. Well worth seeking out. Deep cherry ruby with black reflections and cherry rim. The bouquet is fairly bright, with greenish accents that are more artichoke than bell pepper, supported by peppery spice and some red berry fruit. It's a bit scrappy in a tomboyish way, but inviting. On the palate it's medium bodied, with fairly rich cherry and black currant fruit that gains nice direction from vegetal acidity, and is supported by clean tannins that have a greenish vegetal burr to them, and flow into a clean bitter slightly vegetal finish. It's graceful, and will nicely complement meat based pasta dishes, succulent grilled meats, or light stews. 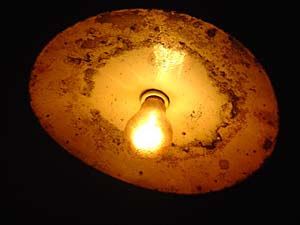 In terms of style, it's scrappy -- not polished, nor buffed smooth -- and if you like this style it will go quite quickly. I found it growing upon me. Worth seeking out. Tawny amber with lively apricot gold reflections and pale amber rim. The bouquet has some sweetness, and bitter almond skins, and yeasts that confer musty overtones; there's also some sweetness. On the palate it's ample and sweet with direction coming initially from dried apricot, which gives way to lasting walnut skin bitterness that carries at considerable length into the finish. It lumbers some, and I'd have liked greater depth and definition to the palate. Deep black cherry ruby with black reflections and cherry rim. The bouquet is fairly direct, with chemical accents that blow off to reveal greenish accents and some underlying berry fruit; I'd have liked more freshness and richness of fruit. On the palate it's medium bodied, with moderate fruit supported by clean citric acidity, and by smooth tannins that flow into a clean sour cherry finish. It's direct, and will drink well with red-sauced pasta dishes, hearty soups, or simple grilled meats; there is also enough acidity for fried foods. Impenetrable pyrope ruby with black reflections and almandine in the rim. The bouquet is closed, though swishing brings up some cedar and slight savory accents, but not much fruit. On the palate it's medium bodied, with moderate cherry fruit supported by clean citric acidity and smooth sweet tannins that flow into a clean finish; there's an empty feel to it, and I found myself wanting greater depth to the fruit. Deep pigeon blood ruby with black reflections and cherry rim. The bouquet is fairly bright, with greenish artichoke accents mingled with intense, sweetish red berry fruit and some graphite shaving bitterness that adds depth. Pleasant, and invites further sniffs. On the palate it's medium bodied, with deft sour berry fruit that has brambly bitter overtones and is supported by a combination of greenish acidity and clean fairly light tannins that flow into a fairly long brambly finish. Pleasant, in a willowy graceful key (it's neither studied nor polished); it will drink well with succulent, not too fatty grilled meats or light stews. A food wine, which will complement what it's served with. Worth seeking out if you like this style. Deep black cherry ruby with black reflections and cherry rim. The bouquet is a bit forced -- it gives an impression of trying very hard -- with some berry fruit mingled with greenish accents, cedar, and spice with savory accents. On the palate it's medium bodied, with moderately intense cherry fruit that gains direction from clean cherry acidity and is supported by smooth sweet tannins that flow into a clean slightly sour berry fruit finish with some tannic underpinning. It's graceful in a lesser key -- the vintage isn't helping here -- and will drink well with simple grilled meats or light stews. Lively brassy gold with greenish highlights and golden reflections. The bouquet is fairly rich, with some citric accents and greenish overtones supported by some greenish heather. On the palate it's bright, with lively lemony citric fruit supported by greenish accents and some bitter accents that flow into a clean fairly bitter finish with herbal overtones that carry into a bitter finish. It's pleasant, in a fairly direct way, and will drink well with grilled fish or white meats, while there is also enough structure for it to be a good bet with fried foods as well. Lively brassy gold with brassy reflections and green highlights. The bouquet is fairly rich, with greenish accents and butterscotch mingled with very green apricot and some bitter almond (or peach pit nutmeat). On the palate it's fairly rich, and rather languid, with ample savory minerality laced with lemon acidity and some greenish accents that flow into a clean bitter greenish finish. It's a bit overcharged for my liking, coming across as trying too hard and as a result disjointed. This said, because of its power it will work well with creamy white meats or richly flavored stewed fish, along the lines of Livorno's Cacciucco. Deep pigeon blood ruby with black cherry rim. The bouquet is fairly rich, with red berry fruit supported by clean spice and cool airy accents that bring to mind dappled shade; with further swishing the shade is joined by slight greenish vegetal notes that add depth, and some chalk. On the palate it's medium bodied, with fairly intense fruit supported by clean bitter accents and moderate berry fruit acidity that flow into a clean fairly bitter finish. I'd have liked more drive and direction on the palate than I found, though it will drink well with simple grilled meats or light stews. Deep black cherry ruby with black reflections and cherry rim. The bouquet has greenish accents and some red berry fruit, mingled with underbrush that has a musty cast to it, and may be due to overly old wood. In other words, it's not as clean as it might have been. On the palate it's medium bodied with moderately intense cherry fruit supported by greenish tannins that again have a tired feel to them, and flow into a greenish bitter finish. Pity about the mustiness; in any case it will work well simple grilled meats or light stews. Impenetrable pyrope ruby; it's poured ink. The bouquet is moderately intense, with an initial rush of cedar with some hardwood ash, and underlying berry fruit. It doesn't give an impression of being closed, but rather retiring. On the palate it's medium bodied, with moderate berry fruit that's overshadowed by bitterness that is cedar-derived, while there is moderate acidity, and the tannic support is from cedar-laced tannins that have some bitter oaky overtones. The fruit is lacking, and the oak steps in to the plate. Well enough, but it's not fruit. Impenetrable pyrope; it's poured ink. The bouquet is fairly rich, with considerable cedar mingled with some berry fruit and savory spice; at present it's clearly quite young, and the cedar sticks out more than it will in the future. On the palate it's ample, and soft, with moderately intense berry fruit supported by very bitter tannins that lay a dusty trail over the tongue and flow into a bitter dusty finish. I found the bitterness excessive -- it's almost tongue curling -- and would also have liked greater depth to the fruit. It will drink well with succulent roasts or stews, but you have to like this style. Impenetrable pyrope ruby with pyrope rim; it's poured ink. The bouquet is fairly intense, with vegetal accents and savory notes mingled with spice and hardwood ash. Not much fruit. On the palate it's full, with ample bitter black currant fruit supported by warmth and savory accents that flow into a clean greenish finish with peppery bitter accents. It's powerful, in a hulking sort of way that brings a an advancing (head down) lineman to mind, and will drink well with succulent stews or roasts. I'd have liked more fruit to round out the structure - its lack is an effect fo the vintage, I suspect - but it will drink well with foods, and you will like it if you like the style. Amber with tawny reflections; it looks older than it is. The bouquet is fairly rich, with honeysuckle and cedar with some mentholated overtones. On the palate it's ample and smooth, with bitter spice and some minerality that flows into a clean butterscotch mineral finish with lasting bitterness. It's overly oaked for me, and the wood overshadows everything else. In other words, it's trying hard to be more than it might have been if it were simply fermented, and suffers thereby. Deep black cherry ruby with black reflections and almandine rim. The bouquet is a bit more mature than I might have expected form a 2004 wine, with warm red berry fruit mingled with warm balsamic accents and some wet horse. On the palate it's full, with rich cherry fruit supported by clean slightly balsamic acidity, and by smooth sweet tannins that flow into a clean berry fruit finish that gains direction from deft balsamic acidity. Pleasant in a fairly direct key, though, as I said, more mature than I expected; it will drink well with succulent roasts or stews, and will age nicely for 3-5 years. If you like this greater maturity you will like it, but if you prefer youthful freshness it's not for you. Lively amber with bright apricot reflections and tawny amber rim. The bouquet is a bit smoky, with bitter walnut skins and some oatmeal tempered by brown sugar sweetness and alcoholic warmth. On the palate it's bright, with lively bitter almond fruit laced with some walnuts, and a considerable load of walnut bitterness that gains direction and counterpoint from some dried apricot acidity and sweetness, though as the finish carries on the bitterness and warmth takes over. By comparison with the other vinranti presented it's much drier, and this isn't a defect, but rather a stylistic choice that hearkens back to the past, when many people's vinsanti were dry (now sweetness is more of a norm). It's more in the mold of a sweet sherry, or perhaps a Marsala Garibaldi, and if you like these styles you will enjoy it very much. If you instead prefer the sweeter style of vinsanto, it will come as a surprise. Nice, but a surprise. Lively ruby with black reflections and cherry rim. The bouquet is fairly rich, with delicate plum cherry fruit that gains depth from savory accents, slight sage, and delicate vegetal accents mingled with warmth and some alcohol; there's considerable depth and it's graceful, though young. On the palate it's fairly rich, with bright sour cherry fruit supported by clean sour cherry acidity, and by smooth fairly light tannins that flow into clean sour berry fruit finish. It's a distinct break with respect to the other wines of the tasting, and will drink nicely with succulent grilled meats or stews. I would give it another couple of years to get its bearings, in any case, because it gives an impression of feeling its way along at present. Worth seeking out.